Aquaflex provides the complete range of PVC materials, from the smallest back garden pond liner to the largest reservoir. Flat sheet liners can be supplied in one piece to almost any size required, although in practice, it is not advisable to take pre-tailored sheets any larger than 100m2. Liners larger than this would require on-site welding. Please call our site lining department for assistance. For much larger quantities of water storage and for more specialised systems of dealing with slurry and dirty water containment, Aquaflex’s long experience of site fabrication comes into its own. Using our specially formulated 0.750mm black vinyl which is UV stabilised and specifically designed to resist root penetration, we provide a superior on site solution for containing vast quantities of slurry and dirty water. Unlike liquid containment in free standing tanks there is no limit to the size of lagoon that can be accommodated. Using this system Aquaflex offers cost effective solutions to pollution control whilst conforming to ministry guidelines. Performance is unaffected by ground movement and the membrane is easily repaired if physically damaged. Aquaflex’s expertise ensures fast installation and can accommodate complex designs. Aquaflex’s specially formulated pond/reservoir lining material offers outstanding performance and value for money. 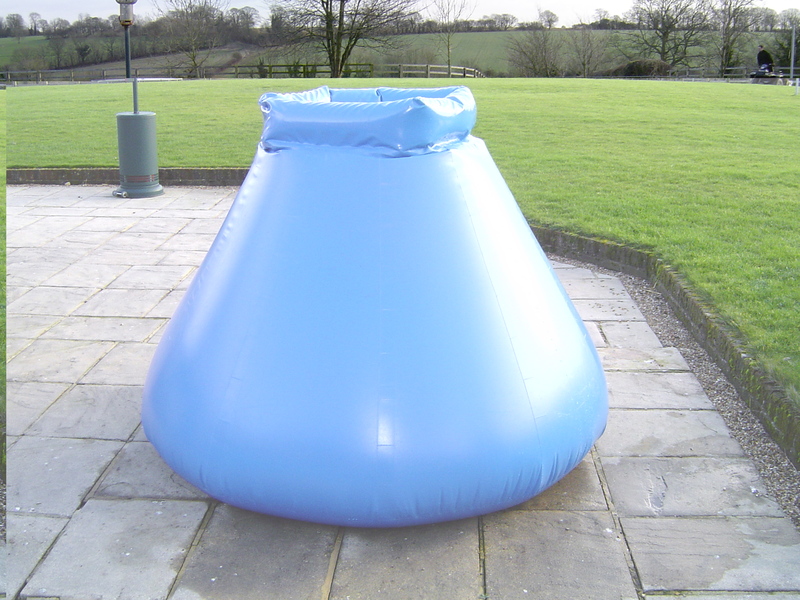 The Easitank is the perfect answer to the problem of temporary water storage on site and is an essential part of any pool company’s equipment. The Easitank utilises robust, polyester reinforced, spread coated PVC, and is supported by an integral, foam filled collar of the same material to give fast and adaptable water storage. Pool professionals who regularly use the Easitank calculate that the investment is very quickly recouped due to the significant time savings on site, as well as saving thousands of gallons of water which is becoming a more and more expensive commodity. the baby of the family, holding about 450 gallons (approx 2000 ltrs) and able to fit into smaller spaces, being only 2m in diameter. holds about 3,000 gallons (approx 13000 ltrs) and measures approximately 4.25m across. roughly 5.5m in diameter and holds in the region of 5,000 gallons (approx 22000 ltrs) of water.